Masked by a non-descript boxy gray building exterior, Alinea Restaurant should be re-named Alinea Interactive Dining Theatre. 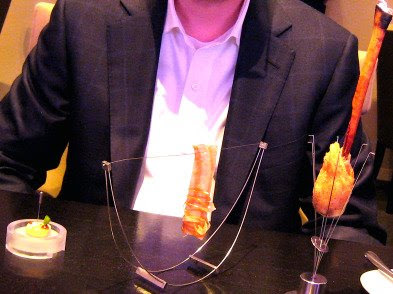 As guests, we were audience to a 3 ½ hour culinary show featuring the most innovative and orchestrated progressive American cuisine, courtesy of Chef/Owner Grant Achatz. From the moment we entered the dark glowing hallway and startled ourselves at the Star Trek-like automatic sliding door, we quickly realized that tonight’s twenty-three course “Tour” would be unique. There were few pleasantries, no ambient music, and no menu provided. The minimalist décor was muted. This lack of sensory stimuli caused greater anticipation for things to come and I soon distracted myself by voyeuristically watching the action at neighbouring tables. The wait staff was polite but somewhat robotic in their delivery, rambling off course descriptions with much speed and little enthusiasm. More impressive was their high degree of attentiveness, as every crumb or watermark was removed from the tabletop within 2 minutes of its appearance. The food, its presentation, and frequently, its consumption, provided the entertainment for the evening. 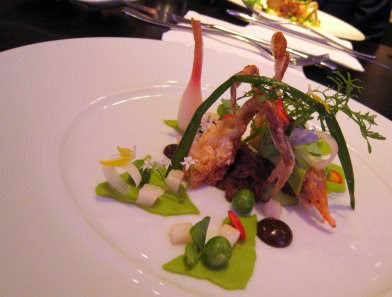 A duo of crab, one served hot as crispy soft shell crab paired with English peas, duck confit, and Asian five-spice notes and the other served cold as a verrine with identical flavours plus a dried ginger concoction and tiny orange pate de fruit cubes, was bold, complex, and delicious. 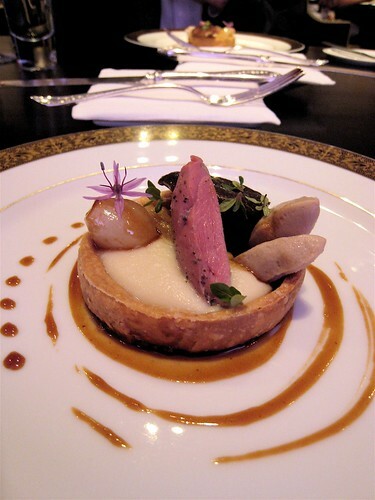 The most satisfying course for my palate was the pigeonneau à la Saint-Clair, a throwback to Escoffier, mainly because of the unfussy traditional flavours of squab, onion, and mushroom (the latter two ingredients being definite components of my “last meal”), a stark contrast to the 22 other hypermodern intricate courses. My choice for most intriguing bite was the green almond encased in a juniper gelée dotted on each corner with salt, sugar, lime zest, and citric acid. Inventive and interactive presentation of the food using odd serving pieces called “the squid” or “the eye” made the act of eating novel and fun. A pin skewered through a hot potato ball, cubes of cheese and butter had to be pulled through a wax bowl before dropping into cold potato soup and slurped up. 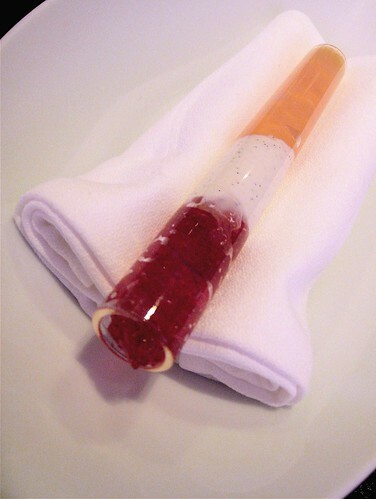 A clear tube filled with a hibiscus, vanilla, and bubble gum flavoured something was sucked out. Harnessing scents to complement a dish was successfully executed by using smoldering cinnamon sticks and pillows of lavender air that deflated by the weight of the plate. The dining experience was sensory and oddly playful despite being set in a room which was the exact opposite, a touch serious and monotone; however, I suspect that this was intentional in order to accentuate the food itself. By the 10th course, I was becoming fatigued and by the 16th course, my belly was pleading for mercy. Because of our late 8:30pm seating, that lavender pillow was looking mighty tempting by the time it appeared at almost midnight. Nonetheless, we persevered and ate every last flossy, foamy, dehydrated, spherical, transparent bite. Unfortunately, after diligently photographing every course, I was delirious with gastronomic overload combined with sleep deprivation and forgot to photograph the final dish! In retrospect, the shorter “Tasting” experience would have been equally outstanding but if you do insist on this extreme dining marathon, then get an earlier reservation than we did. Ultimately, Alinea did not disappoint. The food and eating experience exceeded my expectations, overshadowing any subjective lack of ambience. 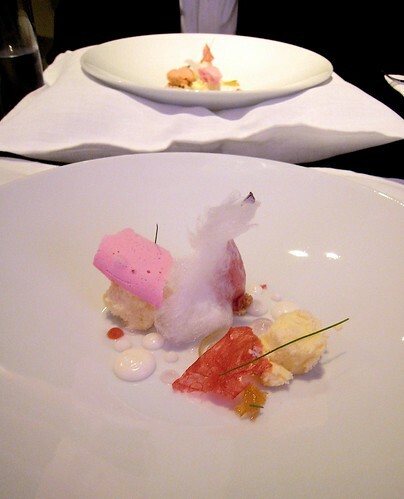 I will safely tuck my souvenir copy of the May 31, 2009 “Tour” menu into my Alinea cook book and fondly reminisce about this once in a lifetime dining adventure for years to come.